I honestly don’t have time these days for a lot of knick-knack decor each holiday that I have to put up, take down, dust, and store. But I do like to rotate a few key decorations for each season. I prefer easy fall decor ideas – practical and useful items that can stay up for a good two to three months, while still reflecting the colors and themes of the seasonal holidays. Tablecloths – highlight a seasonal color with ease by throwing a table cloth on your kitchen table. I admit I often put a plastic protective cover over mine so I can still have the kids at the table without having to wash the cloth constantly. Solids work best for fitting in with other decor items. Napkins – we use cloth napkins in our house, and picking up a set of printed napkins is inexpensive and adds a touch of holiday spirit. Plants – nothing says spring like a cup of daffodils. Summer is fresh cut zinnias or cosmos from the garden, and fall – well, just bring in anything from the yard – leaves, sticks, marigolds or mums! Wreaths – I have fallen in love with the wreath as a home decor piece! You can hang wreaths inside or out. On a door or on a window. In a large hallway. Or lean one against a mantle, table, or stairway. You could even use a small wreath as a table centerpiece with a candle in the middle or a basket of napkins or utensils. So many uses for wreaths! And? Wreaths come in all sorts of colors to fit your decor and the season. I was sent the Fall Orange Wreath from Creekside Farms, which I initially hung from my front door. But then I read that it shouldn’t be kept in weather below 40 degrees, so I brought it inside and hung it over my kitchen sink. Think that makes washing dishes a little nicer? I do! The bright slit oranges are a great fit for fall (my boys think they are mini pumpkins!). 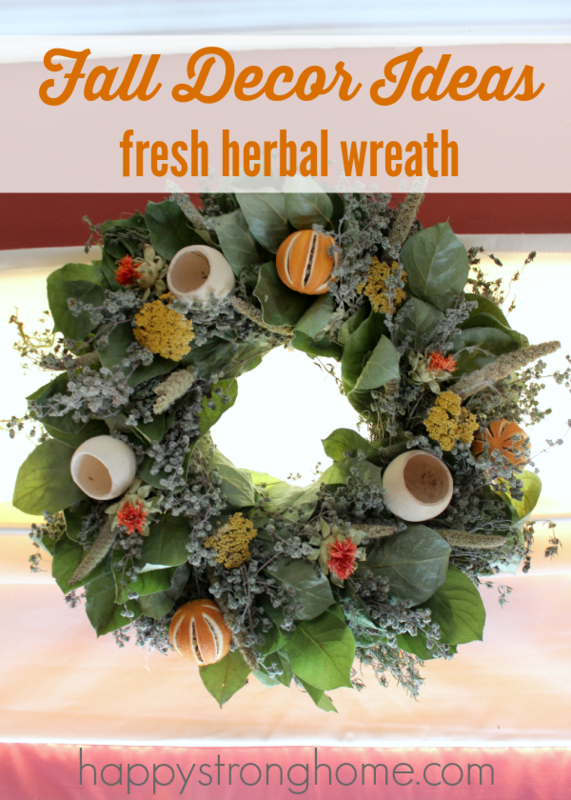 The yarrow in this wreath adds pops of color and is one of my favorite herbal flowers. I think this wreath will transition well into the Christmas holiday, too, because of the white bell cups. Expertly made with fresh leaves, herbs, and dried flowers, my Creekside Farms wreath gives off a mild and pleasant scent. Creekside Farms crafts handmade artisanal wreaths here in the USA. The herbs and flowers in each wreath are naturally grown on Creekside Farms, and never treated with pesticides. Hand-harvested and naturally dried lavender, olive branches, rosemary, sage, marjoram, oregano, thyme, cilantro, dill and various flowering herbs, such as yarrow, monarda and feverfew allow Creekside Farms to create an array of wreaths for each season. Each wreath is crafted extra thick to account for some settling during travel. Use promo code STRONGHOME to get 15% off decorative wreaths at Creekside Farms! What a lovely way to decorate your home for the holidays. Or, send as a long-distance gift. If you own a business, consider sending a gorgeous wreath instead of a gift basket – you’ll stand out! This post about fall home decor ideas with fresh wreaths is made possible by Creekside Farms, and I received a complimentary item in exchange for posting. All opinions are my own.